Following many complaints to the Chief Constable, South Wales Police have confirmed that they are investigating the RSPCA and its inspectors in relation to ten acts of alleged cruelty to German Shepherd dogs, and other welfare offences. It has not been confirmed whether any RSPCA employees have been suspended pending the results of the police investigation into their activities. "German Shepherd Rescue is pleased that its complaint against the RSPCA is being investigated by South Wales Police. These ten poor German Shepherd dogs were treated disgracefully by the RSPCA and its employees." "The dogs were grabbed one by one with a grasper, shot in the head with a captive bolt and then left to die." "The RSPCA is a member of The World Society for the Protection of Animals (WSPA) and the International Companion Animal Management Coalition (ICAM) who specifically condemn any use of a captive bolt by anyone on dogs of any type." "The RSPCA has claimed it's the only time they have heard of such a weapon being used like this, but captive bolts are routinely issued to inspectors." "We look forward to an early confirmation that South Wales Police will proceed to PACE interviews. We believe that serious offences have been committed, and that they merit charges for both the RSPCA and the officers responsible." "It appears that South Wales Police are treating this in a professional an objective manner. We look forward to the outcome of their investigations and interviews with the RSPCA." "We would comment that the RSPCA have recently been charging even more people -especially the young, sick and the old with new offences under the Animal Welfare Act (AWA). The RSPCA spent huge sums lobbying for the AWA, which criminalises any failure to meet animals' needs." "In comparison to the RSPCA's treatment of these ten German Shepherd dogs, on 14 October 2009, farmer Ronald Norcliffe was fined £150 for failing to meet his cows 'psychological and ethological needs' following a prosecution by Kirklees Council. His failure was not providing his cattle with an electric light in the cow shed even though Mr. Norcliffe had no electricity in his farmhouse." "Should the RSPCA be convicted of a criminal offence of cruelty to the animals then it would clearly place their position as a prosecuting authority for this specific type of offence in question." The captive bolt is a slaughterer’s weapon, but it is not used to kill. It is used to stun animals before they are killed by “bleeding out” in the slaughterhouse. It seems that captive bolts are now being used by RSPCA employees to “euthanize” animals which are rescued or which fome into its possesion when owners die. It is not know how the GSD’s died, but RSPCA Headquarters confirmed in several releases that they all did and that captive bolts were used on all. It is not known how many times each animal had to be “bolted” before they were sufficiently stunned. The SHG has previously highlighted rumours that the RSPCA was using the weapon to save money on the massive amount of killing that it does. GSR is a network of over two hundred volunteers who specialise in rehoming GSDs – the RSPCA failed to contact any of them, or anyone they know, with a view to rehoming the dogs that were killed. Ernest Vine on 01559 370566. Mobile 07534 056634. "Could it be that the RSPCA is being driven by financial cuts (£54million) to seek the cheapest alternative without adequately considering the animal's welfare?" The RSPCA has finally apologised “unreservedly” to the Hindu community for killing a Temple’s sacred cow over a year ago. The charity says that it now plans to "reassess its protocol" when dealing with the welfare of animals at "organisations which have a non-violent ethos". No such protocol is in the public domain. The RSPCA raid on the Temple was led by Superintendent Tim Wass who was immediately promoted to Chief Officer of the Inspectorate. On issuing the apology to Bhatkivedanta Manor Temple, the RSPCA claimed that it now recognised the hurt caused to the sentiments of these communities, and wished to build a progressive relationship. Stewart Coyle, the farm manger of New Gukol, a Hindu cow protection programme said: "The RSPCA's resolution will now help to protect all our cows. I believe the temple and RSPCA can now work together for animal welfare". BBC - Inside Out - South East - RSPCA - Kind to animals, cruel to humans? Neighbours of Elsie Nash, 79, who has been convicted on 13 counts of animal cruelty, have voiced their support of Elsie, claiming that she only had the cat’s best interests at heart. During its private prosecution of Elsie Nash, 79, the RSPCA’s legal team showed the court a video of Elsie’s house, taken during in the raid by the RSPCA’s “Special Operations Unit”. The video, taken by Herchran Boal – one of the inspectors on the raid – showed litter trays which Elsie had not emptied, as well as dirty walls and floors. There was also said to be “an overpowering smell”. Those who are aware of the way the RSPCA works will recognise the formula used by the RSPCA’s “Special Operations Units” to support claims that animals were suffering as a result of their surroundings. It is frequently deployed when prosecuting rescue centres not affiliated to the RSPCA. 1. 79 year old Elsie Nash has been found guilty by a district Judge of 13 counts of animal cruelty. 2. Friends and neighbours claim that Elsie only had the cats’ best interests at heart. 3. Douglas Sabin who lives near Elsie in Erdington, Birmingham, said the RSPCA was wrong to prosecute the pensioner. BBC - Inside Out - RSPCA - Kind to animals, cruel to humans? witness coaching and court decides RSPCA expert veterinary evidence ‘unsafe’. For further comment please contact Anne Kasica on 01559 371031 or Ernest Vine on 01559 370566. Former RSPCA employee Heather Nicholson was jailed for 11 years for her part in the animals rights SHAC attacks. The attacks focused on the hapless families of alleged suppliers to Huntingdon Life Sciences. Ms. Nicholson, it seems, has much in common with Robin Webb. Like Mr. Webb, Ms Nicholson left her position in the RSPCA to join the Animal Liberation Front (ALF) and the SHAC conspiracy. Like Webb too, she left an ostensibly innocent job to pursue an extreme animal rights campaign. Robin Webb was just one of several hard-line animal rights activists on the RSPCA’s ruling council. He was recently found by Mr Justice Irwin to be a “pivotal figure” in the ALF. He was filmed by Channel 4’s Dispatches offering advice on how to make a bomb and filmed again in the United States demonstrating how to make a different device. The RSPCA’s PR department put out a press release on 7 January 2009. It stated that young dogs, old dogs and those with thin or sparse coats could benefit from a coat and that letting your dog get cold was an offence. By 13 January 2009, it was warning the same dog owners that they faced prosecution if they followed this advice. Will the RSPCA stop “colluding” too? Mark Saunders’ family are to drop their action against the police, following the Court of Appeals confirmation that allowing police officers to “confer” before making their statements provides them with an “opportunity for collusion”. The Association of Chief Police Officers have outlawed the practice. The RSPCA has been repeatedly criticised by the courts for allowing its inspectors and witnesses to meet each other in conference – and even to alter their statements. RSPCA SAYS "Release animal onto the streets"
Sophie Corless, Regional Press Officer for RSPCA North, stated in a letter published in the Star Newspaper that the RSPCA's helpline was "for anyone who wishes to report an incident of animal cruelty, neglect or abandonment". "Being a charity, the issue is if we step in then we can start being used to plug the gap. If a dog is injured, then we will help, but strays are the responsibility of the local authority." "The SHG finds it strange that the RSPCA will not step in to help an animal in distress because it fears being used to 'plug the gap' and yet it insists on taking out highly expensive private prosecutions. "Could it be that actually helping animals in distress will cost money but snatching helpless animals from their owners for often minor infringements and dragging their owners through the courts brings the kudos of massive publicity and donations?" Catherine Whatmough, 43, rescued a collie as it darted among the cars in Freckleton Street, Lytham, on New Year's Day. The police station said they had "no facilities". Fylde Council's dog warden service had no-one available. The RSPCA helpline told her they "could not take the dog" and that she should "let it back out on to the street". The next day Catherine was able to get in touch with the owner who had reported the dog missing to the council. "If Catherine had released the dog back onto the street, and it had been hit by a car, we have no doubt that the RSPCA would have been only too happy to 'plug the gap' with a prosecution costing thousands of pounds." "Perhaps it's lucky that this dog didn't get to the RSPCA, unlike Jean Stack's poor dog Whiskey who was killed by the RSPCA while his elderly owner was in hospital. The RSPCA kills far too many healthy dogs." "The kindness shown by Catherine and her father in saving this lost pet from injury is what true charity is about." "The RSPCA spends ten million pounds a year on private prosecutions and seven million more on public relations, yet when it comes to the simple charitable things like saving a much-loved pet from injury or worse, many of staff at RSPCA HQ don't seem to care." RSPCA's spokeswoman - Hotline is "for cases of animal cruelty"
British Broadcasting Corporation Radio 4 - Transcript of "File on 4"
When Nicola Bayford faced the choice of feeding her young children, or taking her dog to the vet, she chose to feed her children. However, she also did everything possible to try to get treatment for Julie, her elderly 16 year old collie. This included asking the RSPCA, and several other charities, for help. The RSPCA, of course, refused. When Julie went missing, Nicola showed how much she cared. She walked the streets searching and put posters on lamp posts to try to find her family's much-loved dog. When Julie was found, suffering from fleas, she was taken to the RSPCA. A complaint was made about Nicola to the local Council, who decided to prosecute her for cruelty. Nicola pleaded guilty, trusting that no serious penalty would be exacted. However, she has now been told that she faces jail in the New Year. "Since the RSPCA and others were approached for help to get veterinary treatment for this animal, why were they not standing next to Ms. Bayford in the dock?" "The RSPCA not only knew about, but had the resources to alleviate, the alleged suffering. Instead they wilfully allowed it continue." "Why did tney not turn up as witnesses for the defence when Nicola was prosecuted by the council?" "All we get from the RSPCA is a bizarre statement that the inspector was 'too busy to prepare a prosecution'. Would the RSPCA accept that as an excuse from anyone they were investigating?" "we are seeing an alarming rise in the numbers of people being prosecuted after having approached the RSPCA for help, although it is usually the RSPCA who do the prosecuting." "Animal keepers are in a Catch 22 situation." "If they ask for help they are likely to be prosecuted by the RSPCA." "If they don't ask for help and are prosecuted, the magistrates will be told by the RSPCA that help is always available and failing to ask for help has caused unneccessary suffering. Ms. Bayford's case clearly shows that these claims are incorrect." In the same week that MORI were accused by Horse & Hound of pro-RSPCA anti-hunting bias, a huge crackdown on hare coursing has been launched by the RSPCA and various local authorities and constabularies. One of the 3,500 new offences created by New Labour was to criminalise the hunting of hares with dogs. Hare coursing was, until 2005, a popular and legal countryside sport, as it remains in Ireland. Oxfordshire PCs Darren James and Marc Lester are just two of the officers whose time is now spent on this animal crime as part of "Operation Migrate" and "Operation Countrywatch". Both PC James and PC Lester patrol the Downs near Wantage in one of several long-wheelbase Landrover Defenders. "We now have far too many demands on the time and resources of the police. One of their biggest problems is that highly funded animal rights campaign groups such as the RSPCA put intense pressure on the police to concentrate on more minor offences instead of dealing with burglaries and assaults." The issues raised over the Oxford situation are being repeated all over the country. Chris Newman of the Federation of Companion Animal Societies (FOCAS) wrote to the Chief Constable of Hampshire Constabulary last year when his 15 year old son was assaulted and needed hospital treatment and the police were too busy to interview him until some six weeks later. In the letter Mr. Newman contrasted this with the police presence at an animal welfare incident only two and a half weeks after his son was assaulted, in which, in addition to other attendees, two police officers and three Police Support Officers were present for approximately four hours. Council appointed Animal Welfare inspector Paula Davies was present throughout and led the investigation into whether the comfort of some pet rabbits had been met. Mr. Newman asked the Chief Constable whether it was police policy to give priority to animal welfare over human welfare, under what remit civilians such as the RSPCA are permitted to use police facilities to pursue private prosecutions, and whether costs of the use of those facilites are recovered from the RSPCA. Chris Newman of the Federation of Companion Animal Societies can be contacted on 02380 434368. Does hunting poll show MORI bias against hunting? ... of hares on their lands, and we earnestly appeal to them to use their rights and powers to protect the hare from the abuse that is live hare coursing. Feb 6, 2008 - The Department of the Environment says the Government has no plans to ban hare coursing, even though the Green Party wants to see it done away with. Around 30000 people have been attending the three-day National Coursing meeting in Clonmel, Co Tipperary. The Prosecutions Department of the RSPCA, led by barrister Sally Case, has been handed another large bill for the charity’s donors to pay. This time by Gateshead Magistrates in Tyne and Wear, for prosecuting Michael and Sharon Finnie who mistakenly treated their pet dog Pebbles for fleas when he had a skin condition. The RSPCA recently sought to characterise Tyne and Wear as the cruellest locality in the UK. “The SHG believes that the CPS should actively quality control all RSPCA prosecutions by taking over and dropping those which are clearly not in the public interest and which no responsible prosecutor would bring. The cruelty allegations against Mr and Mrs Finnie were that they failed to seek the advice of a vet. It was common ground that Michael and Sharon Finnie were treating Pebbles for fleas, but she turned out to have a different skin condition. The case was handled by Clive McKeag, a partner in the Newcastle law firm McKeags. Mr. McKeag is the RSPCA’s lawyer in the North East. Gateshead Magistrates said they would not be making any award for the RSPCA's legal and veterinary costs to be paid from central funds. The bill which the charity has to pay runs to over £2,600. The Magistrates also turned down a request from Mr McKeag for the RSPCA to keep Pebbles – they ordered that Pebbles must be returned to Mr and Mrs Finnie immediately. The Finnies were on low incomes. Anti-cruelty campaign helps RSPCA retain pole position for second month in a row. The RSPCA has made it two months in a row at the top of NGO Watch, after claiming animal cruelty rose 24 per cent last year. Ernest Vine on 01559 370566. The new RSPCA figures indicate a huge rise in successful RSPCA prosecutions. How have they achieved such spectacular results? The SHG wants to know exactly how much of the RSPCA’s increase in successful prosecutions has been the result of such underhand and disgraceful tactics. 1) Farm assurance scheme with just 10 officials? 2) Track record of neglect and cruelty on its farms? 3) Squalid conditions on intensive pig farm? 5) Industrial turkey shed littered with dead birds? Q. Why did Tesco describe Hugh Fearnley-Whittingstall’s gibbering as “hypocritical publicity mongering”? A. Erm … because that’s what it was. The SHG regularly says “NO” to the RSPCA too! Conditions on an RSPCA monitored Freedom Food farm April 2008. The dead, dying and rotting filmed over two weeks at a ‘hell hole’ RSPCA Freedom Foods farm. www.guardian.co.uk/media/2007/mar/13/animalrights.broadcasting - 65k - . ... Hugh Fearnley-Whittingstall that it is attempting to sabotage his call to improve chicken welfare standards as "hypocritical publicity-mongering". The SHG condemns the killing of another elderly woman’s pet dog by the RSPCA. Jean Stack was forced to leave her Yorkshire terrier, Whiskey, alone when she was taken into Whiston hospital. It seems that the tragedy occurred because the RSPCA were just a little bit quicker at killing a dog than usual. The original investigation into Whiskey’s killing was conducted by Vicki Kellaway of the Liverpool Echo. The Liverpool Echo has reported that the RSPCA has already apologised for its “blunder”. The charity’s excuse this time is apparently that “they had no way of knowing the dog was anything other than a stray”. Presumably, the RSPCA believes that its policy of killing strays so quickly is a popular one with the public and will be readily understood. This is a tragic story, but far from unique. The RSPCA puts down thousands of healthy dogs a year. It admits to killing more than 2,000 perfectly healthy animals – that’s more than 40 a week. Jean Stack had no idea her dog had been destroyed until she came back from hospital. She asked her son to inquire about the dog’s whereabouts, and he was told that Whiskey had been destroyed the same day. After Mrs Stack was taken into hospital, Whiskey was subsequently taken from her home in Huyton to the local police station. He was then transferred to the RSPCA in Halewood, where it was apparently assumed that he was a stray. The RSPCA is believed to be considering an appeal against Judge Kainth’s ruling. 2. The RSPCA spends 44% of its annual income of over £100,000,000 (one hundred million pounds) on its prosecutions department. 3. In the light of Judge Kainth’s findings, the RSPCA, which claims to apply the Code for Crown Prosecutors, will have to satisfy Sally Case, Head of Prosecutions, that it has considered whether each of the allegations stands “a reasonable prospect of success” and is “in the public interest”. 4. The RSPCA is a private body so there is no mechanism to challenge the decision which Ms Case reaches. 5. Mr. Gray’s animals had been placed with organisations such as the International League for the Protection of Horses (ILPH) and Redwings, with whom the RSPCA has a special relationship and with whom it worked on the raids which it conducted against Mr Gray. The SHG is very concerned to note that the RSPCA has found yet another target for its extreme activities. It has recently focussed its operations on yet another hard-working farmer and his wife. The RSPCA’s media teams, journalists and photographers (including a photo journalist) have been at East Farm in Barnham for the last five days. East Farm, the new point of focus for the RSPCA’s media-based operation, is farmed by Edward Heading. Mr Heading, and his wife Margaret, are tenants of the Duke of Grafton, who himself lives nearby at Euston Hall. The Headings are typical RSPCA suspects – they are hard-working farmers of good character. They also run a highly-rated bed and breakfast from their farmhouse. The RSPCA’s operation against the Headings is commanded by Mark Thompson, whose job-title at the RSPCA is “Chief Inspector”. Mr Thompson is a veteran of many RSPCA raids, and he has been regularly critical of magistrates’ “leniency” in the past. An example was the infamous “fat dog” case (RSPCA v David and Derek Benton), for which Mark Thompson was personally responsible. Thompson was also concerned in another disastrous prosecution, when the RSPCA wrongly accused Martin and Gina Griffin of cruelty to one of their horses. Mark Thompson is supervised by Timothy Wass, the RSPCA’s Regional Superintendent for East Anglia and the Midlands. Mr Wass will shortly assume command of the RSPCA’s entire Inspectorate and has been repeatedly called upon to resign. He is another controversial figure in the animal rights movement. He was personally responsible for the RSPCA’s bizarre operations in December 2007 against the Hindu temple at Bhaktivedanta Manor, and involved in the infamous “Spindles Farm raids”, in which over 100 horses were seized. These both attracted unprecedented and wide ranging criticism of the RSPCA’s aggressive handling of the cases. The media have, as is usual for an RSPCA investigation, been afforded access to the Headings’ farm and its animals during the investigation. This is important to put pressure on the farmers and to generate the headlines that the RSPCA needs for its fundraising. According to news reports, the RSPCA have seized and photographed over 100 cattle and taken them to a “place of safety” to a farm which has a good relationship with the RSPCA. They will apparently be cared for there at the expense of the RSPCA’s charitable funds – although it seems many of the animals have already been “euthanized”. Only one cow was killed during the raid on the Hindu Temple - the East Farm raids show that the Hindu is experience is far from unique. Concern about the RSPCA in a number of different forums has recently reached new heights. For example, The Horse Trust (“THT”) and The British Horse Society (“BHS”) are now leading a group of 16 animal welfare charities demanding a major review of animal welfare procedures in England and Wales. The SHG supports their demands – the fairness and integrity of the RSPCA’s welfare procedures and prosecutions is regularly, and rightly, being called into question. This is because the RSPCA is completely out of control. It has no checks and balances and its activities against farmers and others unlucky enough to come into contact with the RSPCA’s enforcers are hitting the national papers on an almost daily basis. The RSPCA still brings over a thousand prosecutions a year, but its number of convictions has regularly fallen. These demands for review were followed by the intervention of Shadow Environment Secretary, Rt Hon Peter Ainsworth MP, who joined a host of high-profile politicians worldwide who support the campaign against the RSPCA’s killing of Gangotri. THT and BHS, by contrast with the RSPCA, are universally respected – they have asked Princess Anne, to convene their review into how welfare investigations are conducted. The remarks of Peter Aisworth, THT and BHS follow further revelations about the RSPCA and their “independent expert” vet Nic de Brauwere, which emerged from the ill-fated prosecution of Martin and Gina Griffin, supervised by Mark Thompson. That case, like so many of the RSPCA’s private prosecutions, ended in more highly-embarrassing disaster when the RSPCA and Nic de Brauwere were severely criticised by Judge Philip Browning. The conduct of the RSPCA’s Spindles Farm raids, again using “independent expert” Nic de Brauwere, has also contributed to the calls for urgent review. The SHG, and its many supporters, are calling for a full investigation into the killing of Gangotri, and a change in the RSPCA’s stance on trespassing on farms, and unlawfully killing animals without the owners’ consent. Mr Ainsworth has given his support to this campaign, saying that “at Bhaktivedanta Manor, something happened which should not have done”. The SHG welcomes this, and notes the recent, but not unprecedented, spate of high profile criticisms of the RSPCA, and its procedures, by judges and magistrates in the courts – of which the RSPCA v Griffin case was just one. The RSPCA, after all, has a long-standing conviction for perverting the course of justice - and that is itself another reason why the SHG, more than 30 Hindu organisations and many others, including farmers, and pet owners who are genuinely concerned about the standards and fairness of investigations, are calling for a review, and also for the resignation, or immediate dismissal, of Tim Wass. “The two cats were found dead, and were examined post mortem by a veterinary surgeon assisted and observed by a colleague. The former provided evidence … but before the case came to trial, she emigrated. Her colleague became the principal veterinary witness for the prosecution, therefore it was necessary to establish her in opinion (sic). She was not experienced in giving evidence in court, and ultimately the District Judge felt that he was unable to attach any weight to her evidence. “The RSPCA takes the view that the principle issue here was one of the lack of credibility of the veterinary surgeon rather than the issue of ‘coaching and rehearsal’. Crucially, this vet did not make it clear to the Court that it was her opinion that the animals had been caused to suffer and that her opinion had not been influenced by the ‘proforma’ which had only been referred to as an aide in the production of expert witness statements. The RSPCA routinely provides guidance for vets about how to write a complete report for use as evidence in court. In this case the first report provided by the vet didn't give all the information needed, and so a second one was written in accordance with the guidance. This is not out of the ordinary - the evidence did not change, just the details that were included. “I am very concerned to hear about the East Farm raids. I agree with the Horse Trust’s Chief Paul Jepson when he says ‘the welfare system is not working’. “The RSPCA, and its sinister anti-farming agenda, are the main reason for this. It seems that the Headings were not members of the RSPCA’s Freedom Food assurance scheme. People, and farmers who are not members of this scheme in particular, are living in daily fear about what might happen when the RSPCA illegally enters their farm. The Headings were a very hard-working couple - tenant farmers who run a successful bed and breakfast from their farmhouse, which offers an authentic farming experience. “I agree with Mr Macaulay, the RSPCA’s Head of Media, that it is necessary for well-respected welfare charities to meet and discuss the problems with ‘independent experts’. They should do so very urgently – otherwise this will happen to a lot more farms. The RSPCA is completely out of control and is engaging in raids on people’s properties and farms which are reminiscent of Nazi Germany. The need for review arises, as the recent front-page article in the Veterinary Times points out, from the RSPCA’s ‘independent experts’ thinking they should act primarily as advocates for their paymaster, and not as court-appointed independent experts. “I do not know what Mr Macaulay, RSPCA’s Head of Media, meant when he said of a recent case ‘the evidence did not change, just the details that were included’ when the RSPCA successfully invited their ‘independent expert’ to alter her written opinion – this is also something which Mr Macaulay says is done ‘routinely’. Strong anecdotal evidence suggests that Mr Macaulay is right –RSPCA experts often produce a draft report, which is not disclosed but is edited by the prosecutor to produce a second report which is both disclosed and relied upon at trial. Perhaps the best recent example of that was the case of RSPCA v Burden, where the prosecutor accepted that he had written the final report for the expert which was disclosed. The Burdens, who were hard-working sheep farmers, were wrongly accused by the RSPCA, and they were also rightly acquitted. “Place of safety” kennel convicted of cruelty! Being prosecuted by anyone, let alone the RSPCA, which has a conviction for perverting the course of justice, is a stressful business. However, if you are unlucky enough to have your pet seized by the RSPCA or the police and taken to a “place of safety” pending your trial, the least you would expect is that the animal will be properly looked after – even if it pines for you until you are triumphantly acquitted. There is generally no need for animals to be seized, but the RSPCA regularly ensures that animals are taken. It also seeks to recover the (often enormous) costs of boarding them from owners who are successfully prosecuted. The RSPCA, ever hungry for scalps, has brought a successful private prosecution against ‘place of safety’ kennel-owner Stuart Millington. He has been convicted of cruelty to fifteen dogs, which had already been seized once from their owners. Each dog was therefore the unlucky subject of at least two simultaneous criminal cases. Tameside Magistrates' Court heard how the RSPCA began an investigation into Millington after one owner complained about his pet’s poor condition when it was released. He had taken it to a vet. All 15 animals at Mr Millington’s ‘place of safety’ were ‘found to be in an extremely poor bodily condition'. The kennels were “cold and wet with rough concrete floors, no food or water and little evidence of bedding”. The dogs had also acquired a number of wounds, including tail tip injuries. Some had to have their tails amputated. All the dogs had all been placed with Millington because he ran a reputable licensed boarding kennels. Their care was being paid for, and the police and the RSPCA `fully expected them to be given the same high level of care as any other animal’. Mr Millington, 61, of Hilltop Kennels in Mossley, admitted leaving 15 seized dogs with nothing to eat or drink in bare concrete kennels. The animals were in his care after being formally seized by Merseyside police during investigations conducted by them and by the RSPCA. Mr Millington was charging fees for looking after them while their various owners were taken to court. At least one of the dogs was linked to RSPCA and police investigations arising from the death of Ellie Lawrenson. The SHG believes that the bizarre and unfortunate case of RSPCA v Millington shows that seized pets suffer in the care of the “places of safety” to which they are taken by the police and the RSPCA. This suffering is not just being separated from their owners – in the ill-fated cruelty case which the RSPCA brought against Annette Nally, the RSPCA were ordered to provide boarding records for Holly, her pet dog. The “place of safety” produced records for the wrong dog, and it was later revealed that none of the treatments which the RSPCA’s vet had prescribed for Holly had ever been administered. Holly had died five months into her stay, but Ms Nally was not told until six months after Holly’s death. When Ms Nally was acquitted, the RSPCA admitted it had lost Holly’s body, but only after they had been told to return it. No doubt because of his good relationship with the police and the RSPCA - and perhaps also because he was not a farmer – Mr Millington was neither banned from keeping animals, nor sent to prison. He was fined just £2,000 with no further penalty - other than an order for some of the prosecution’s costs of the case, which, for a guilty plea, at £8,000 are significant, but not high by the RSPCA’s standards. The costs of £8,000 are believed to have included further vets’ bills and more boarding charges. Bad Karma for Gangotri’s Killers? On 13 December 2007, an RSPCA team which included a vet chose to enter the Hindu Temple at Bhaktivedanta Manor. Its purpose was a premeditated mission of death – and the team successfully killed Gangotri, a sacred cow, in the middle of the Temple without the knowledge of consent of the monks, or their vets. Just hours before, the RSPCA had asked to enter the Temple. They and their vets had been invited in as guests, and they had been taken to see Gangotri. The monks say that they were assured by the RSPCA that no immediate action would be taken. Gangotri had been injured by a bull, but was being nursed back to health by possibly the most intensive, caring and informed regime of monks and specialist vets that any organisation could assemble. Gangotri was not sick and had never, for example, tested positive for any disease or even TB antibodies. The monks’ gentle vegetarian lifestyle, and their respect for all animals, demanded that Gangotri be given a truly admirable routine of intensive care and that she be treated with respect. Instead Gangotri got the usual “needle of death” treatment, which the RSPCA calls “euthanasia”. The RSPCA’s actions have provoked an international outrage – and not just among Hindus. The sacrilege in the Hindus’ Temple will, the SHG believes, come to be regarded as one of the most grotesque acts of unlawful madness - and there are many - committed by the RSPCA’s animal rights activists in recent times. The killing of Gangotri has launched many thousands of comments and articles in the media. This is because many farmers, pet owners and others have suffered similar experiences with the RSPCA. Many people who are not Hindus have contacted the national and local media to demonstrate their support. We believe that many of them will be at Parliament on 13 February 2008 to show their support for the brave Hindus campaign against the RSPCA’s actions. In response to the international incident which they have created, one of the RSPCA’s most senior PR gurus, Sophie Wilkinson, has claimed that her employers “were not deceitful” and that the police “were not duped” by the RSPCA. It seems, from what Ms Wilkinson says, that the RSPCA is claiming to have obtained a valid search warrant, despite the fact that the RSPCA knew all about the animal. This is not exactly “positive spin”. Ms Wilkinson’s handlers know that they have not just desecrated a temple – they have revealed that, whatever other people think, and no matter what their vets say, the RSPCA always knows better. In short, the RSPCA evinces an astonishing arrogance. It is not at this time known whether the misguided Magistrate (who is claimed to have issued the warrant) or the police were actually told by the RSPCA that members of its own “Inspectorate” and vets had been invited in as guests and had been allowed to see, and examine, Gangotri just a few hours earlier! Why a warrant came to be issued - and perhaps more importantly what was said to get it - is a complete mystery to the SHG. Also, why the RSPCA bothered to obtain a warrant at all (if it did) is another mystery, as the RSPCA and their “Special Operations Units”, in particular, regularly trespass on land and take away and kill farm animals and pets without having any powers to do so. The RSPCA also admits, in relation to just dogs, that its employees and vets killed well over 1,000 in England and Wales in 2006 alone. The figures for horses, cats, cattle and other types of pet and farm animals are not released – the RSPCA is a private organisation, albeit still a charity. Anne Kasica of the SHG comments: “What was Gangotri to the RSPCA? She was originally just another fund-raising opportunity for a charity that regards every non-perfect animal as a chance for a cruelty conviction, a press release or a big donation. What is she now? Her ashes will be sprinkled on the Ganges and she now represents one of the biggest PR disasters that animal rights activists in the RSPCA have ever committed. The RSPCA’s terrible act of sacrilege is, at least, sure to cost the RSPCA millions of pounds in lost revenue. Ernest Vine, also from the SHG, comments:“What is sad about this case is that the Hindu monks were treated no differently from other people who have their paths crossed by the RSPCA – that is, of course, arrogantly, cunningly and reprehensibly. For recent examples, you need look no further than the outrageous cases brought by the RSPCA against Gina and Martin Griffin, decided two weeks ago, or the shameful case of Annette Nally, which was decided only last week. Look at what Judge Philip Browning and Judge David Chinnery have had to say about the RSPCA’s actions in those cases. If you are not convinced by them, then read what District Judge Gray and the Portsmouth Magistrates said in the two infamous cases before Christmas involving a primary school teacher and a kennel maid which have been so well covered in Private Eye. “We have, of course, been helping people with their difficulties with the RSPCA for nearly 20 years - just after the RSPCA was originally convicted of perverting the course of justice. It’s fair to say that we think that most of the RSPCA’s killing is actually done for cost reasons. In this country, if you work for the RSPCA, you can kill a lot of other people’s animals using animal rights as an excuse. Sensible people believe in animal welfare and doing their best to care for animals. The RSPCA’s ‘euthanasia’ has become its weapon of first resort. Whether you are a farmer, or a pet owner or a vegetarian monk, who has sworn an oath to protect all animals from suffering, it matters not – your animals, if they are sick, are at risk of being put to death or taken away so that you never see them again. Annette Nally has, following 5 days in court and the expenditure of tens of thousands of pounds, joined the list of highly-respectable Defendants to RSPCA private prosecutions who should “never have been prosecuted”. Her case was tried by Judge David Chinnery – its sole result being even more serious criticism of the RSPCA’s beleaguered Prosecutions Department, which the RSPCA says is led by Barrister Sally Case. Judge Chinnery’s remarks, in particular, focussed on the RSPCA’s non-disclosure of very important documents which showed the case was misconceived. The Learned Judge found that the case had been been “punctuated with stops and starts due to the non-disclosure of documents by the [RSPCA] that should have in my opinion been disclosed to the defence from the outset”. The RSPCA claimed that, because it was a private prosecutor which was (incredibly) “not used to bringing prosecutions”, it did not think that it needed to disclose documents which undermined the prosecution case in the same way as the CPS would have to. Yet again in this case, the RSPCA’s actions following seizure of the dog, prevented documents which dramatically assisted the defence from being seen by the court and the defence until the trial was in full session. The undisclosed documents would have shown that Holly’s ears had not required any treatment at all after the RSPCA took her. How then could an omission on Annette’s part be proved, it might be asked. When disclosure of these boarding records was required, the RSPCA disclosed the wrong ones. The dog whose records were released was not Holly. When Holly's notes came through it became clear that there had been no treatment whatsoever for her ears. However, more than this, the routine wormers and broad-spectrum antibiotics, which the RSPCA's vets claimed had been prescribed, had never once been recorded as having been provided to the dog! So much for Annette’s failure to provide this “necessary” treatment! It was obviously very lucky that the mistake which the RSPCA claimed to have made in relation to the notes was eventually uncovered. However, it was too late for Holly. She died six months into her stay with the RSPCA. Annette was not told about this, and only found out five months after Holly’s death. She was, like so many animal owners who have had their animals taken away, not allowed to see her dog in the RSPCA’s “place of safety”. Annette is still waiting for Holly’s body to be returned to her so that she can lay her to rest. Following the case, Annette Nally broke down in tears and was unable to speak. The good news for her is that she will not have to pay the tens of thousands of pounds of costs which the RSPCA ran up in prosecuting yet another ridiculous case. 1. The claim that cruelty is “an offence of strict liability”, requiring no mens rea (“wrongful mind”) and an objective standard of care, is one which the RSPCA’s team of highly paid specialist lawyers makes time and time again. The Court of Appeal made clear findings on this point in RSPCA v Peterssen - a Defendant has to behave unreasonably in all the circumstances as (s)he knows them to be. However, the RSPCA took another specimen case to appeal - RSPCA v Isaac (correct). There, the RSPCA’s lawyers appeared alone, having promised Ms Isaac an acquittal, but failed to cite RSPCA v Peterssen to the Court of Appeal. Indeed, the Court of Appeal in Isaac was led to, and it is clear from the judgement of Lord Justice Holland did, believe the case was the first occasion that the 1911 Act had ever come before a court of record. Many lawyers, inexperienced in animal welfare law, have since fallen for the “strict liability” argument. We would direct them, and the reader, to the unreported cases rightly relied on by the defence in this case. In RSPCA v C - another of the more infamous RSPCA cases - the RSPCA unsuccessfully appealed findings that it was wrong to impose a uniform adult standard of care on a child. The child was said by the charity to have failed to summon a vet to care for a cat with a bad tail sufficiently quickly. 2. The RSPCA, in order to increase the “stigma” that defendants like Annette have to face before and during trial, promotes the idea that there are strong links between child abuse and animal abuse. Jonathan Silk, South West Regional Director RSPCA, is Chairman of "The Links Group”, whose sole purpose is to promote the idea of a strong link between these most regrettable, and in our view unrelated, phenomena. 3. Annette Nally's case is very far from being the first time that such serious findings have been made against the RSPCA. Indeed, as a very basic example, and as seasoned “RSPCA-watchers” will all know, the RSPCA has a conviction - which, unsurprisingly, Ms Case and her team of highly-paid specialists do not like talking about - arising out of the RSPCA v Retallick case, for perverting the course of justice. Very senior personnel from the RSPCA were involved in disciplining one of their own inspectors for allowing material which assisted the defence to fall into the hands of the defendant’s lawyers (see Attorney General v RSPCA, The Times  22 June). The result of this, back then, was a huge fine in the Attorney General’s contempt proceedings against the charity. comes the damning judgment in Norwich, on the afternoon of 23 January 2008, of Judge Philip Browning. It concerned Martin and Gina’s 24 year old laminitic horse Florrie, which had been a family pet for two decades. where the Defendants own vet - with whom the RSPCA ‘expert’ disagreed – was advising them. The RSPCA’s ‘expert’ in this case was Nic de Brauwere. Rather worryingly for the RSPCA, in the light of the court’s findings against it, Mr de Brauwere is the vet in the RSPCA’s recent high-profile seizures in Amersham. Mr de Brauwere is in charge of welfare at ‘Redwings’, the rescue centre which the RSPCA pays to stable many of its ‘rescued’ horses. The Griffins vainly tried to tell de Brauwere that they knew the horse was thin and that they had to keep its weight down to avoid an acute recurrence of the long-standing laminitis. This is not only good equine practice – it followed the excellent advice obtained from their horse’s vet, Charlotte Mayers, who knew all about the horse, but with whom it seems that de Brauwere disagreed. So, the RSPCA’s ‘Inspector’ John Jenkins and Mr de Brauwere thought they knew better than the Griffins’ own vet. The horse was seized from the Griffins’ field where all the other animals, everyone agreed, were in superb condition. Three ‘cruelty’ charges eventually emerged. The animal was taken to a “place of safety” - de Brauwere’s facility - and his clients, the RSPCA, blindly pressed on with its case. They were undeterred by the report of Colin Vogel, the country’s pre-eminent equine specialist (who incidentally writes the RSPCA’s own “Horse-Care Manual”). Mr Vogel was called as an expert by the defence. 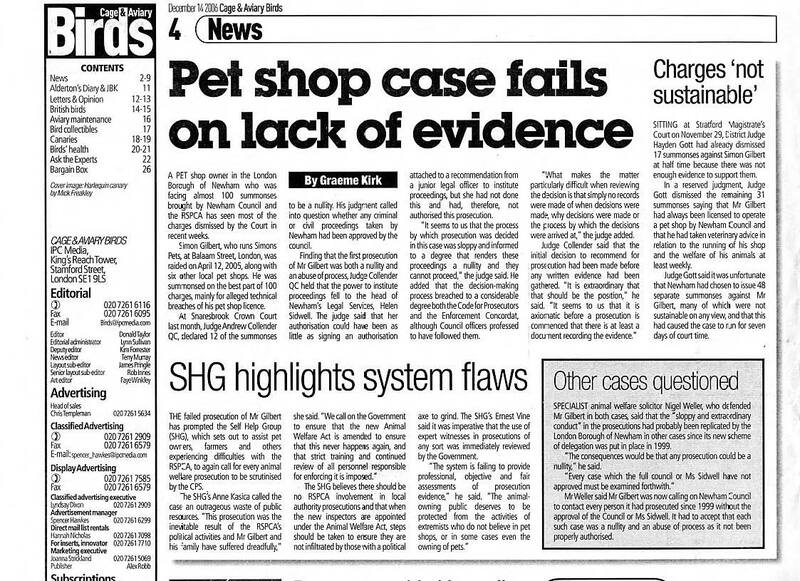 The SHG speculates that the RSPCA might have brought the case to highlight the 10th anniversary of the damning report from BEVA (the British Equine Veterinary Association). BEVA’s concerns – one of many criticisms by specialist vets – are attached for ease of reference. Is it possible that Sally Case, the Barrister in charge of the RSPCA’s Prosecutions Department, and her team of highly-paid support staff and “out-house” lawyers, wanted to emphasise the correctness of BEVA’s report? Ten years ago, it was hastened by specialist equine vets who were concerned that the RSPCA was damaging the profession. The criticisms in RSPCA v Humphries are quite well summarised by BEVA, and every one of these points could be made of the RSPCA again today. The RSPCA has learned nothing in ten years, other than better ways of causing expense, distress and misery for ordinary decent people, like the Griffins, who look after animals properly. It has also “generated publicity” recently! Name Withheld**Names removed to protect individuals who have been the subject of animal rights harassment.Can be supplied but only to bona fide journalists. The SHG challenges the Crown Prosecution Service to Review every RSPCA prosecution after two RSPCA prosecutions collapse following evidence of witness coaching and court decides RSPCA expert veterinary evidence ‘unsafe’. The Self Help Group for Farmers, Pet Owners and Others experiencing difficulties with the RSPCA (The SHG) is challenging the Crown Prosecution Service to review every RSPCA prosecution following startling revelations. Magistrates made serious criticisms of RSPCA Inspector Janet Edwards’ failure to explain what offences were being investigated. Steadfastly refused to disclose relevant documents to which the Defence were entitled. Attached as a word doc. Anyone who has seen the figures recently released by the RSPCA would believe that the introduction of the Animal Welfare Act 2006 has caused a 20% drop in convictions when comparing the years 2005/6. A glance at the graph below shows this to be completely untrue. Conviction rates have been falling steadily since 1998. The exception to this trend was the dramatic rise in 2005 followed by a return to steady falls as reflected in the 2006 figure. “The SHG believes that if the government were to introduce an NHS for the animals of pensioners it would do more to reduce animals suffering than all of the animal welfare legislation that has been passed while this government has been in power. The current legal aid changes will lead to increased delays, miscarriages of justice and higher costs as more RSPCA cases go to appeal, claim the Self Help Group for Farmers Pet Owners and Others experiencing difficulties with the RSPCA (the SHG). I have been involved with an RSPCA prosecution and without the legal aid I was given would never of been able to fight my case and successfully win. My solicitor was a specialist in animal welfare cases and also my barrister was very experienced in this particular field, both were situated over 350 miles away from my home. I am positive that if I had used a local solicitor my case against the RSPCA would of been lost. My experience with the RSPCA was two years of hell for myself and my family and if it wasnt for the skilled experienced solicitors and barristers that I found with the help of legal aid, I am sure I would not of won my case. The Law Society – What Price Justice? The Self Help Group for Farmers Pet Owners and Others Experiencing Difficulties with the RSPCA (the SHG) is receiving calls from worried animal owners who believe that the RSPCA have been given new powers by the Animal Welfare Act 2006 (AWA) and who are realising that there are no safeguards written into the AWA that will protect people’s civil and legal rights. “Despite claims by Jackie Ballard, the Director General of the RSPCA, that the AWA ‘enables our inspectors to prevent animals suffering by taking effective action earlier in cases of ongoing neglect.’ the RSPCA have been granted NO new powers under the AWA” said Ernest Vine of the SHG. As the RSPCA flexes its muscles with the introduction of the Animal Welfare Act 2006, The Self Help Group for Farmers, Pet Owners and Others experiencing difficulties with the RSPCA (The SHG) asks what the AWA has actually achieved. The RSPCA are claiming a massive increase in the numbers of animals handed in and abandoned. The SHG challenges the RSPCA to help a sick animal in distress after the RSPCA’s insurance company refuses to pay out. The Self Help Group for Farmers, Pet Owners and Others experiencing difficulties with the RSPCA (The SHG) is challenging the RSPCA to live up to the reasons behind its charitable status and help a sick animal which has been left to suffer following a refusal by an RSPCA insurance company to pay for its treatment due to a technicality. Mr. Vine explained that in a recently reported case a woman from Cambridge who had not noticed her pup’s collar had become too tight took him to the RSPCA looking for help and was prosecuted and banned from having custody of animals for three years. The SHG urges government to introduce a National Animal Health Service which we believe would do more to reduce animal suffering than all of the animal welfare legislation that has been passed while this government has been in power. For further comment please contact Anne Kasica on 01559 371031 or Ernest Vine on 01559370566. The RSPCA failed to alleviate Rusty's suffering. All they achieved was to add the hunger pangs of starvation to the pain of arthritis and hip dysplasia and to separate Rusty from those he loved. "It is not the Government's intention to punish the owners of fat cats, although overfeeding an animal can be problematic"
Said Ernest Vine of the SHG: "We hope that once the AWA is in force the RSPCA will comply with the intentions of Parliament and will never again bring a case involving an overweight animal before the courts." "Rusty was suffering in the care of the Bentons. Rusty has been suffering in the care of the RSPCA. And Rusty will continue to suffer until the day he dies, irrespective of whose care he is in." "Most of Rusty's weight gain occurred following an operation to neuter him. Neutered or spayed dogs need 30% less food than unaltered dogs and it is this factor that is contributing to so much obesity in the canine world." "In Rusty's case this reduction in food intake has to be added to the reduction necessary to account for his inability to exercise because of the pain from his hip dysplasia and severe arthritis and his need to lose weight. The only means by which he can lose weight is for his dietary intake to be restricted." According to Duncan Davidson, the defence vet, Rusty had unusually large amounts of grass in his faeces and was desperate to eat grass when outside. Rusty's need to eat grass can be explained by Mr. Davidson's estimation that Rusty needs a 75% reduction of the normal labrador's dietary intake. Anne Kasica said "So the RSPCA have replaced the suffering of being overweight with the suffering of feeling continually starved and desperate to eat. No-one can cure Rusty's arthritis which is the cause of his obesity. Indeed, if it were so easy to diet Jackie Ballard, the Director General of the RSPCA would have gone through life with a slender waif like build." "Which form of suffering is worse? Rusty cannot walk and exercise even when slimmed down because of his arthritis. And in his twilight years the one pleasure that every Labrador is renowned for enjoying, eating, has been denied him as a result of this ill-judged political prosecution." "The Bentons were found not guilty of causing unnecessary suffering by failing to adequately treat Rusty's ear condition because with all of the immense resources available to them, the RSPCA had also failed to cure it. Just as they have failed to cure his eye problems and arthritis." Indeed, Rusty had enjoyed treatment paid for by pet insurance for most of his life. But his pet insurance ended when he reached the cut off age. And the Benton's vets, Pet Doctors, refused to treat Rusty unless they were paid cash up front. Pet Doctors also refused to let the Bentons pay in instalments. Said Anne Kasica: "The massive costs of the RSPCA's treatment regime for Rusty were beyond the purse of any ordinary pet owner. The RSPCA could have offered to help with the cost of veterinary treatment for Rusty but instead chose to spend many thousands of pounds in prosecuting his owners. They put Rusty through further misery by separating him from the people he loved and taking him from the only home he knew." "This case highlights the reasons why people are afraid to approach the RSPCA for help. We have been campaigning for some time for an animal NHS for the animals of pensioners because just when insurance is most needed, when an animal becomes elderly and its owners income drops, is the time insurance is no longer available. The SHG urges the government to take steps to control RSPCA prosecutions by requiring them to be scrutinised by the police and CPS before they are allowed to proceed, and we ask the CPS to actively quality control all RSPCA prosecutions by taking over and dropping those which are clearly political or which no responsible prosecutor would bring. The third prosecution (another 60 summonses) of pet-shop owner Simon Gilbert by the London Borough of Newham has just been dismissed at Stratford Magistrates Court and the Legal Department have just confirmed that all its proposed appeals will not be pursued. I opened my pet shop more than quarter of a century ago, when I was just 15. I have never had, or been in, any trouble at all, until the RSPCA and local councils started raiding the local pet shops. On one occasion, six were raided the same day as us. 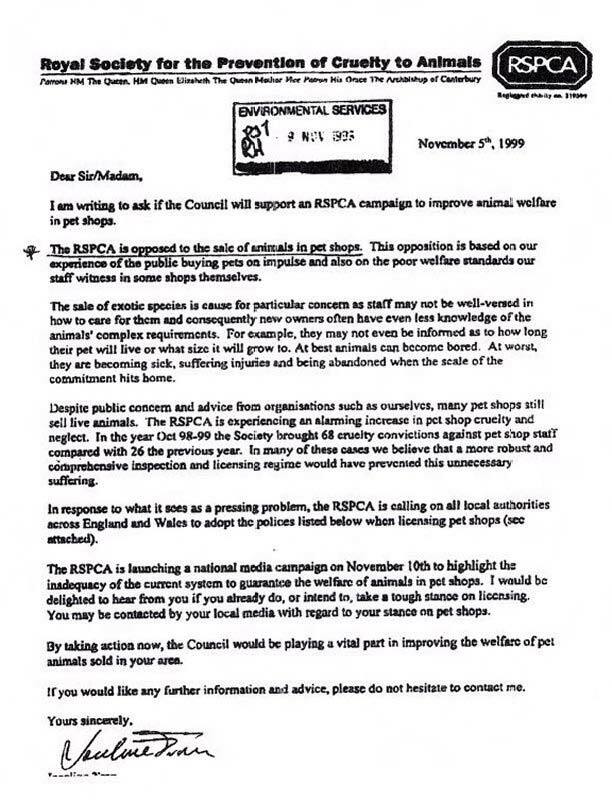 The RSPCA have been against pet shops and selling animals for a long time. I did not know that the Council had adopted the RSPCA’s stance and it seems from the judgements that a considerable number of people at the Council may not have realised this either. However, my licence got more and more complicated every year. If a window was open, the wardens said it was draughty. If it was closed, they said it was not properly ventilated. Welfare specialist from the Bristol Vet School, Dr Sue Haslam, who was commended by the judges, said that conditions at our shop were better than the vast majority of veterinary surgeries. Years of serious prosecutions and the best part of 200 summonses (all of which have been dismissed) have taken their toll on me and my staff. I had to move my family to Ireland to protect them from death threats and other animal rights activities. The so-called prosecution experts, including local vet Martin Lawton, were rightly criticised by the court. I am grateful to my legal team Nigel Weller and Jonathan Rich for uncovering what was going on and protecting my reputation against a malicious campaign waged unlawfully in the name of the London Borough of Newham. There must be other hard-working people in the area who have had similar experiences. I would urge them to contact their lawyers. For my part, I have had enough and I am looking to leave. Having been here all my life, I feel unsafe from a Council to which I have paid hundreds of thousands of pounds in tax. In return, the Council improperly allowed out-of-control dog wardens to harass us and spend tens, if not hundreds of thousands, of pounds of our money pursuing an unlawful and dogmatic campaign against my pet shop. So many good local projects go begging for a little cash. Having dog wardens, following an animal rights agenda, politically opposed to my sale of Dalmatians and Spaniels, spending money like water, is like putting temperance campaigners in charge of our local pubs. RCVS disciplinary findings in relation to prosecution vet, Martin Lawton. Following yet another failed animal welfare prosecution The Self Help Group for Farmers, Pet Owners and Others experiencing difficulties with the RSPCA (The SHG) again calls for every animal welfare prosecution to be scrutinised by the CPS. The SHG believes that there should be absolutely no RSPCA involvement in local authority prosecutions and that when the new Inspectors are appointed under the Animal Welfare Act 2006 steps should be taken to ensure that they are not infiltrated by those with a political axe to grind. The SHG again calls for a full Public Inquiry into the RSPCA and its activities. The SHG asks the CPS to protect the public and call in every Animal Welfare Prosecution for a full and independent review before permitting the prosecution to go ahead. The SHG demands a full review of the use of Expert Witnesses by prosecutors. In the wake of the failed RSPCA prosecution of primate owner Jason Allen The SHG again calls for a full public enquiry into the RSPCA and its activities and for the CPS to call in and review every RSPCA prosecution. As the dust settles in the wake of the failed RSPCA attempt to prosecute primate owner Jason Allen The Self Help Group for Farmers, Pet Owners and Others experiencing difficulties with the RSPCA (The SHG) again calls for a full Public Enquiry into the RSPCA and its activities. The SHG is appalled that the government can allow a charity, which lobbies Parliament for the law to be changed, to investigate and prosecute people whose very activities are those that the RSPCA may be campaigning to end. This means that the RSPCA can never comply with the requirements of the Code for Crown Prosecutors that a prosecutor be fair, independent and objective. Had the RSPCA succeeded in proving that it was illegal to separate mother and baby of any animal type on the grounds that they suffer from stress then pet keeping and farming in this country would have come to an end. The SHG asks the CPS to protect the public and call in every RSPCA prosecution for a full and independent review before permitting the prosecution to go ahead. The Self Help Group for Farmers, Pet Owners and Others experiencing difficulties with the RSPCA (The SHG) is appalled at the possibility of RSPCA Inspectors being empowered under clause 15 of the Police and Justice Bill to hand out fixed-penalty notices of £80 or £100. This news comes as at least one local authority (Luton) is considering cutting its dog warden service due to lack of funding and as the Animal Welfare Bill (AWB) is about to go to Report stage. The SHG believes that despite Government claims, it is clear that there will be no new money for local authorities under the AWB and that the RSPCA will become the default Inspectors. Animal keepers will be utterly powerless to protect their pets when faced with an Inspector who will have, in addition to sweeping powers granted to him under the new AWB, the right to issue an on the spot fine to anyone whose behaviour he thinks is threatening or anti-social. Any animal keeper who dares to get upset if an RSPCA inspector criticises the care he has provided for his animal, or because the inspector intends to remove his animal is going to be at risk of such a penalty. The RSPCA claims that cruelty figures have risen. Their own figures for the past ten years show that cruelty convictions are actually lower now than in 1995. Over the past decade the figures peaked around the turn of the century and then steadily declined. Any living animal coming into their care has only a 50% chance of life. It is clear that the figures released by the RSPCA have, at best, been misunderstood. For a full analysis of the figures and comment see Attachment 1. For RSPCA data 1995 - 2005 see the Excel spreadsheet Attachment 2. The RSPCA claims that cruelty figures have risen. Their own figures for the past ten years show that cruelty convictions are actually lower now than in 1995. (Sheet 2). RSPCA failed to publish prosecutions in the 2005 Annual Review. RSPCA sources suggest 1604 prosecutions for 2005. Work Unit* is direct cost per activity undertaken by the RSPCA divided by expenditure for year. has only a 50% chance of life. Prosecution figures are unavailable for 2004 and 2005. The RSPCA have not released them. They have changed the way they report them. Highlighted figures in red were obtained from a July RSPCA press release and were labelled ‘cases reported’. Anyone who has seen the media reviews would believe that cruelty figures have increased by massive percentages, yet the RSPCA’s own data shows that over a decade the figures peaked around the turn of the century and then steadily declined. N.B. Two different sets of figures? The RSPCA annual report details resources expended on prosecutions as £5.5 million but in the July Information Cruelty Statistics the costs are just over £3 million. Which set of figures is correct?